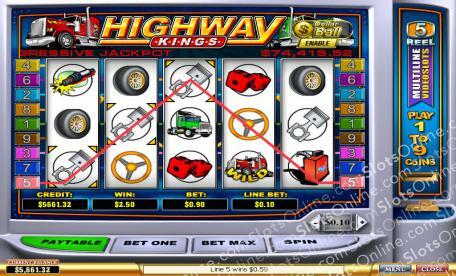 There's a little bit of trucker inside us all, and Highway Kings is sure to bring it out. Click here to play! Sound off your horn as you pass by a buddy on the road and deliver the shipment you're carrying ahead of time to receive a sweet bonus when you get back home. In Highway Kings, you'll get there faster by stocking up on supplies and choosing the right truck. Remember, while yellow and green trucks are all well and good, the red ones go faster. Be sure to take a fuel can with you or plan ahead to visit the cheapest fuel stops, or this trip could cost more than you bargained for. It can be a hard life being a trucker, but Highway Kings takes the highlights - the big rigs, the horns and the money - and leaves out the long hours on the road. Your shipment is due in just a few more hours, so you better hit the road and start playing Highway Kings if you want to make it in time. Scatter symbols are mufflers. They pay out bonus money based on how many are onscreen. 2 pay out the bet, 3 pay out 5 times the bet, 4 pay out 10 times the bet, and 5 symbols pay out 100 times the bet. Red truck symbols are wild and can substitute for normal symbols, but not scatter symbols.